Es gibt zwei neue Posse für Wild West Exodus, den Abraham Lincoln’s Secret Service und Felipe Espinosa`s Bloody Espinosas. The Secret Service continues to defend the Union from the shadows. 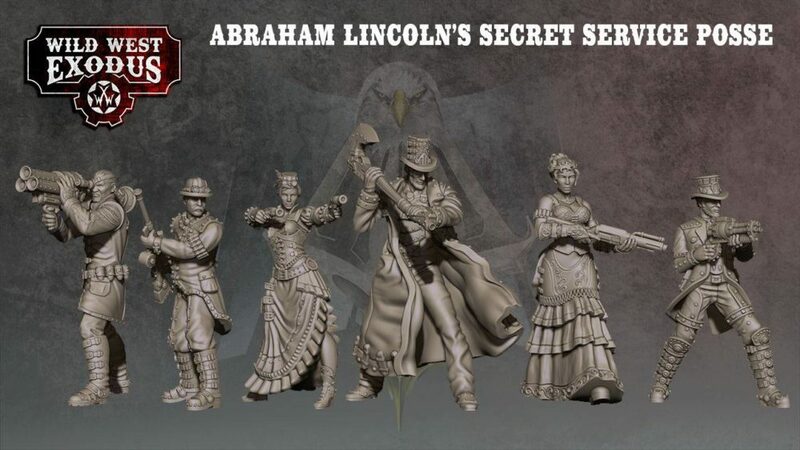 Led by the remarkable Director Lincoln, the agents of the Union undertake all manner of assignments too difficult or morally questionable for the army. Robert Pinkerton is Lincoln’s strong right hand, giving sage counsel to the fearless former President. Henry Courtwright is a master saboteur and Automata specialist and Agent Lucinda Loveless is a legend in the Service having saved the Union from insidious foreign plots on several occasions. Camilla Blanche is an expert in clandestine infiltration and assassination while Milo Jefferson makes up for his relative inexperience in the field with his specialist knowledge of artillery and armour weak-points. Look out for the Secret Service – sneaking up on you… soon! 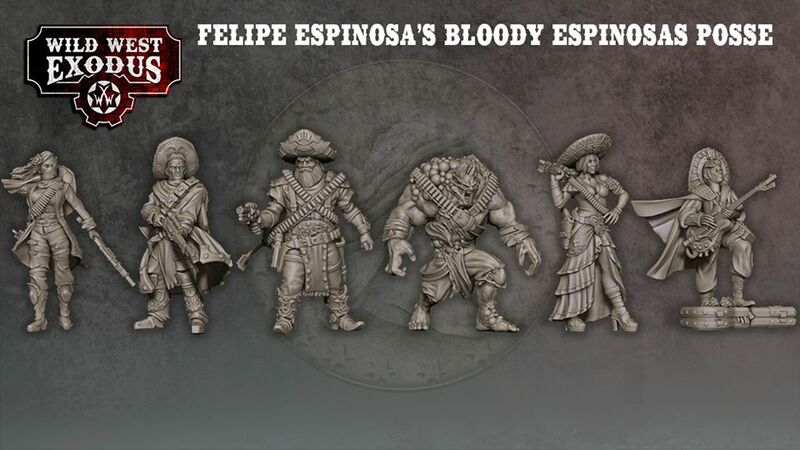 Felipe Espinosa is one of the most ruthless and treacherous bandits to curse the American frontier. Leading the twisted mariachi band ‚The Bloody Espinosas‘ Felipe has a dreaded reputation as a bounty hunter and raider. while the youngest, Pedro, is content to amuse himself by playing a tune and adding to his collection of trophies cut from his victims. Vivian Espinosa was once like his brothers but found true love with the beautiful Sofia Antoniela. Wanting to leave the blighted band for a new life, a fight with his brother Jose mortally wounded him. As he lay dying, his tainted soul transformed him into a drooling Hex Beast. His wife, Sofia, could not be parted from him even in this new form and nursed a shred of his former personality from the hulk of flesh and pain he had become. Aber die Abe Lincoln Posse schlägt für mich den Boden aus dem Fass, figurentechnisch, schon fetzig!